Have you heard of this new trend? It’s called Crack Slaw. It’s apparently a big deal and it’s got such an interesting name that I just had to see what it was. It’s pretty simple, actually. Once I figured out what it was, I knew it would be an ideal, low Points Weight Watchers recipe. It’s high in protein but low in sugar and carbs – so it’s perfect. I did some research and came up with my own version – and it’s amazing. 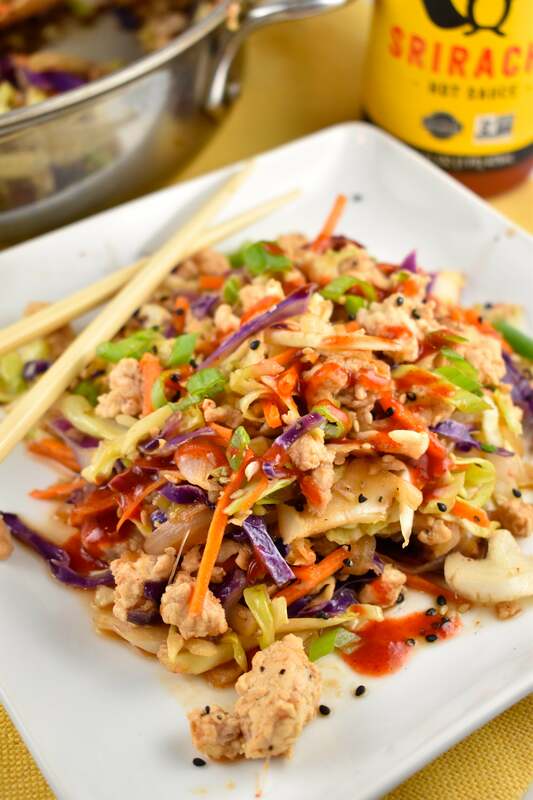 It’s a quick and easy low stir fry recipe made with shredded cabbage and ground beef. It earned the moniker “crack slaw” because it tastes so incredibly delicious that it’s addictive. The first thing that I did was to swap out the ground beef with ground chicken breast. It lowers the fat content and lowers the point content. 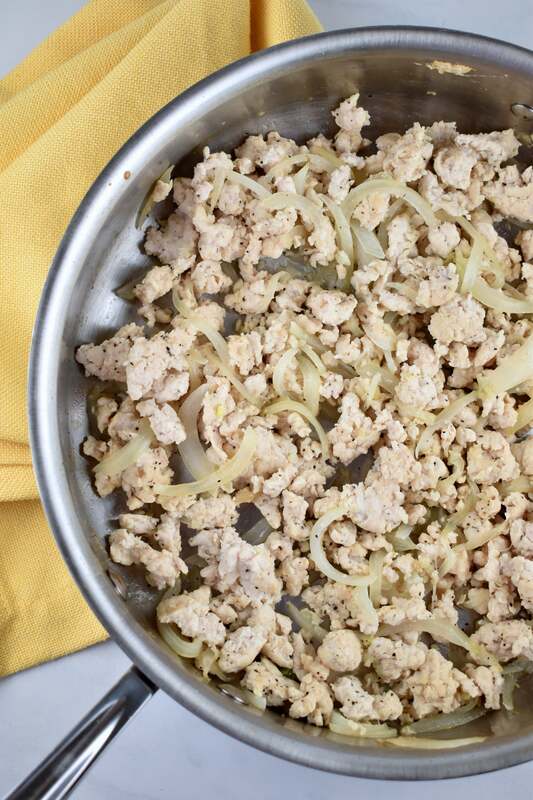 You could use ground turkey breast if you happen to have that on hand. Your ground chicken doesn’t have to be store bought either. I’ll often have leftover roast chicken that I can use in recipes like this. Just stick it in the food processor and pulse it until it’s finely chopped and add it in. It’s a great way to use up leftovers that you have on hand instead of buying special ingredients. For this recipe, I used some packaged, shredded cabbage, because I’m all about making life in the kitchen faster and easier. But you could just as easily shred a head of cabbage yourself, if you’d prefer. 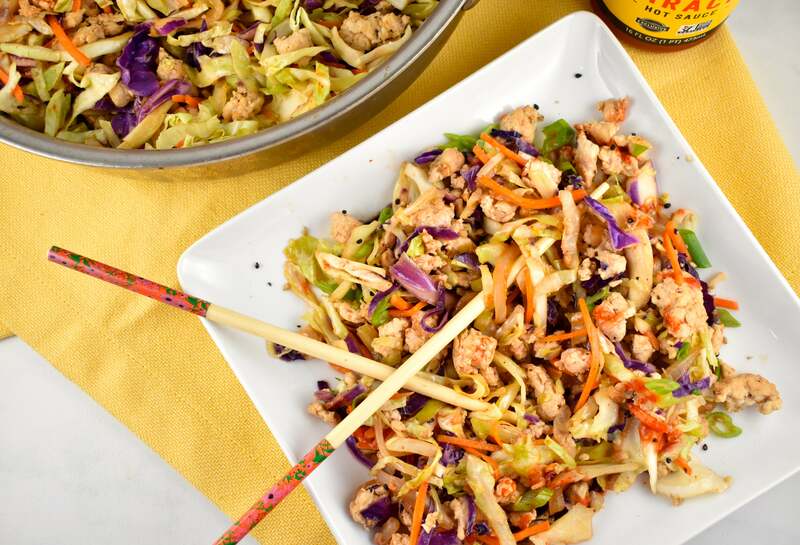 The cabbage adds fiber to the recipe and helped it stretch farther without adding extra ingredients or Points expense. The onion, garlic and ginger are perfect to add the flavor and give it a more Asian flavor. I’ve also made this recipe with a package of broccoli slaw, instead of cabbage, and I really like that version too! If you haven’t tried broccoli slaw before, it’s basically just shredded broccoli. 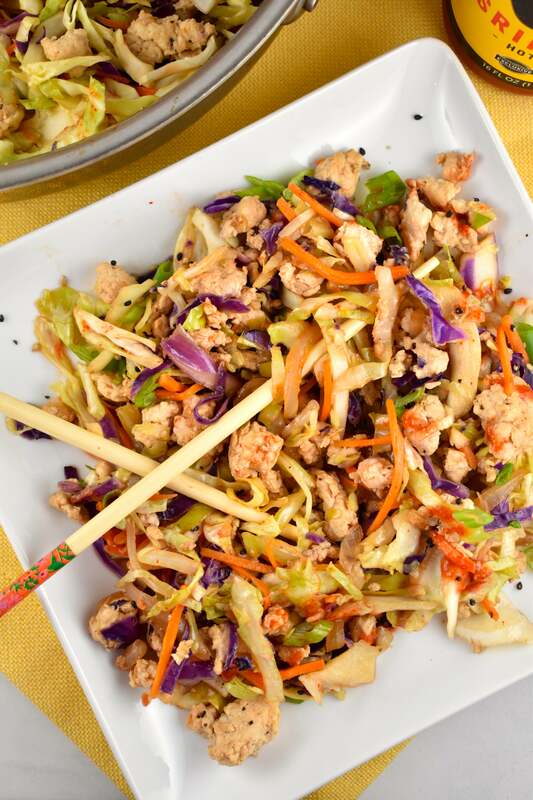 It’s got a brighter and bolder flavor than cabbage, and packs some extra nutrition in there. You can make your own broccoli slaw, but many grocery stores have broccoli slaw in with the bags of shredded cabbage, coleslaw and lettuce. I use Trader Joe’s Organic Broccoli Slaw. It’s just shredded broccoli stems and carrots. It’s organic and has great flavor and is packed with vitamins and minerals from that rich green broccoli. 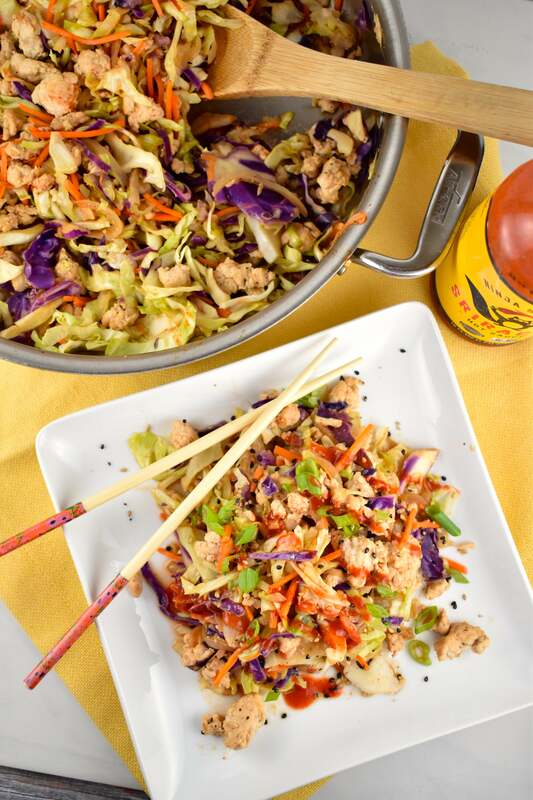 The seasonings in this crack slaw recipe are simple but just make the whole dish come alive. I used a little olive oil to cook the onions, but then seasoned the whole dish with soy sauce, sesame oil, rice vinegar and sriracha. And, boy, was it amazing! The bold soy sauce and the tangy vinegar work perfectly together. The toasted sesame oil smooths out the flavor a little bit, and the sriracha adds that spicy kick that just puts it over the top. Sriracha is a spicy pepper sauce you can find in the Asian section of just about every grocery store. My personal favorite brand is Ninja Squirrel Sriracha, which I buy at Whole Foods. It tastes exactly the same as the original sriracha, but it’s cleaner, with no preservatives. You can play with the heat of this Crack Slaw as well. If you like it hot, you can add some more, or just use a few drops if you like it milder. But I wouldn’t recommend leaving it out entirely, since it adds that little extra spice that makes this amazing. 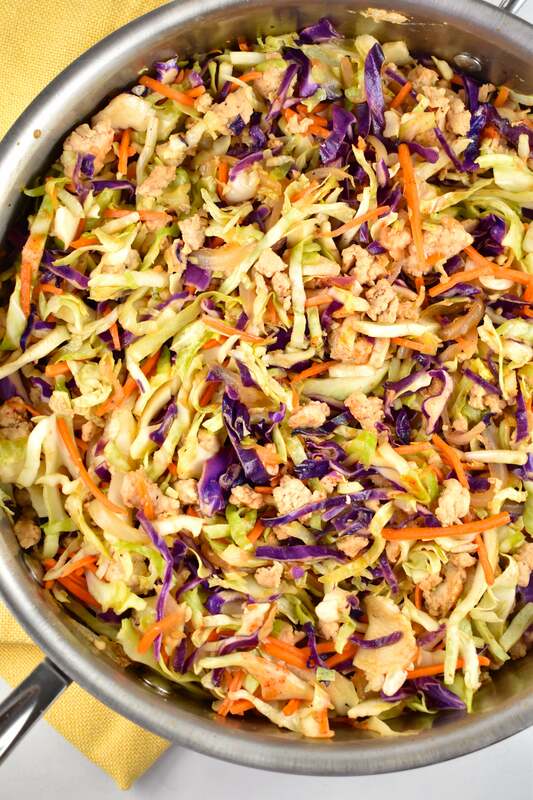 While I’ve used broccoli slaw and cabbage to make this dish, you can toss in any veggies you have on hand, and that’s one of the best parts. You could do some bell pepper, snow peas or mushrooms. It’s so simple and easy to put together, tastes amazing and is really low in fat and calories. A perfect Weight Watchers meal for a busy night. And once you try it, this Crack Slaw recipe will easily become a staple meal. This low calorie, low carb, high protein recipe is all the rage these days. It’s a simple chicken and veggie stir fry dish that is so good, it’s addictive. Heat olive oil over medium heat heat in a large skillet. Add in onions and saute until fragrant, 1-2 minutes. Add in chicken, garlic and ginger, and cook, while breaking up with a wooden spoon, until browned. Remove chicken from skillet, and add in the cabbage. Cook until wilted and mostly tender, about 4-5 minutes. Return the cooked chicken to the pan. Stir in sesame oil, soy sauce, vinegar, and sriracha. Season with salt and pepper and more sriracha as desired. AMAZING! This will be a new staple in our household! Thank you for sharing such a tasty dish! This was very good. My husband inhaled it and I loved it as well. Also wonderful were that I had all these ingredients on hand! I just wish people would stop calling food crack this, crack that. Having witnessed the horrors of actual crack addiction (not personally or family related – Thank God), I just find it offensive and off-putting and tend to ignore recipes with that as the title. I also used a bag of Broccoli Slaw that I found in Walmart. Sooooo good! What happened to the broccoli slaw? I love this recipe but all of a sudden the ingredients changed? I made it with Broccoli Slaw and it was delicious! Has anyone had success with freezing this and heating up later? What can be used instead of Siracha sauce? Hot sauce maybe? Yes this is six smartpoints! I used the WW app and when you put in the ingredients AND leave it as one serving it is 6 SmartPoints. Once you change the servings the points drop. 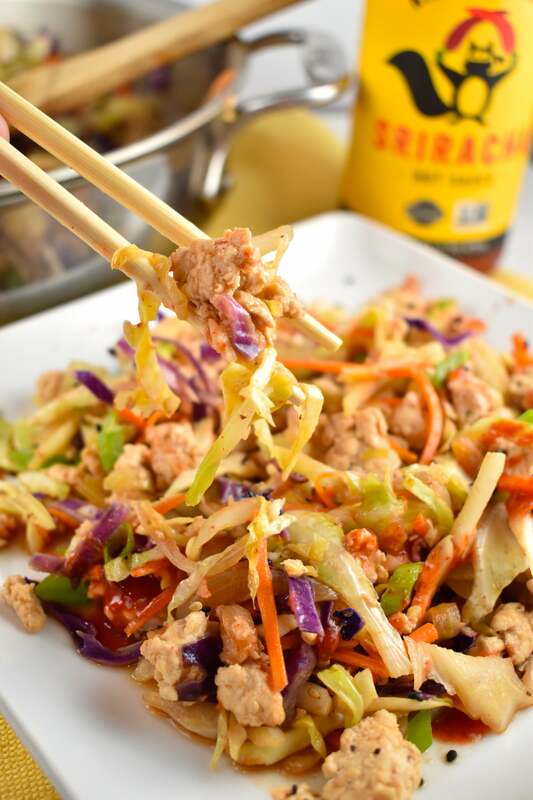 I make this all the time, got a little confused when I didn’t see the broccoli slaw, but then read the comments. I used the broccoli slaw and cabbage. The broccoli slaw sends it to the next level. Thank you for posting this recipe, very tasty. I made this tonight and I was very skeptical. My husband and son were watching me make it and ready to order a pizza…but I have it say it was DELICIOUS! We all loved it! Thanks for a great recipe! How does this recipe have 0 grams fiber? Because I use the Weight Watchers calculator to tally the Points for each of my recipes, I only list the nutritional value for the ingredients that will count towards the Smart Points total. So all fruits, vegetables and any other 0 Point are not included in the nutritional values that I list. Who cares how many points! Just made for myself – as I had most ingredients on hand (except I used ground turkey and real broccoli). Seriously, I’m gonna eat this from now til I die! Also had the same thing happen when I tried to print. Hopefully you can help me understand how you are getting 2 points per serving on this recipe. When I put the recipe in WW, I get 6 points per serving. Still not bad but am I doing something wrong? Sure! The only ingredients that will count towards the Points are the chicken, soy sauce, vinegar, sriracha sauce, olive oil, and sesame oil. Using the labels on the back of each of those items, I added up all the nutritional info, and my totals are posted at the bottom of the recipe. I entered those totals into my calculator to get the Points value. on the WW points plus there are 0 points for soy sauce, vinegar and sriracha sauce. The only ingredients that would add points are the chicken, olive and sesame oil. Thanks for the detail recipe. Can’t wait to try it. If you create a recipe on the WW website and add in these exact ingredients, it’s a 6 point meal. Still really good, but definitely not 2 points per serving. The ground chicken alone is 18 points…which divided by 4 is already more than 4 points per serving. Ground chicken BREAST is 1 point for a 4 ounce serving. A pound is 16 ounces. So, each full pound of ground chicken breast is 4 points. There is a difference between ground chicken and ground chicken breast. I hope this dispels the confusion. Mine came up at 6 points also so I added extra cabbage, changed it to 5 servings and got it to 4 points. I also used turkey sausage which really gave it an added zip. The “Print Friendly” button doesn’t work on IE, Chrome, or Opera….just sets up the photo and article 1st page. A little guidance on the cabbage would have been nice…what is a medium cabbage? In our area a 3 pounder is small and half of that is was way too much cabbage (I made a wild guess that it needed to be shredded…no mention in the recipe.) Maybe a measure could be used, such as “Shred 1 pound of cabbage” or something to that effect. Oh my gosh…that looks so good! I must be the only one to have never heard of crack slaw, but I want to make it this weekend, if I can get to the grocery store. Thanks for posting!